Have your parents ever told you what your first food was? Mine was creamed corn. My mother told me that she gave me a bite of her creamed corn when I was 7 months old and I nearly attacked her entire plate trying to get more. 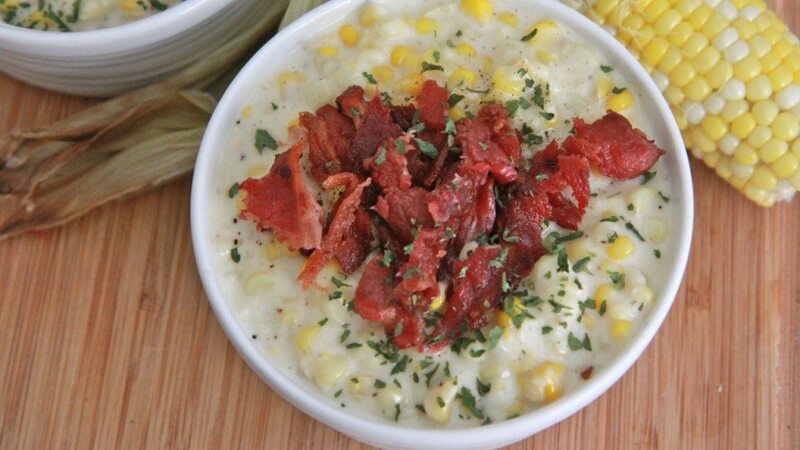 I still LOVVVE creamed corn to this day but rarely make it. Whenever I do decide to make it I vow to make it more often. 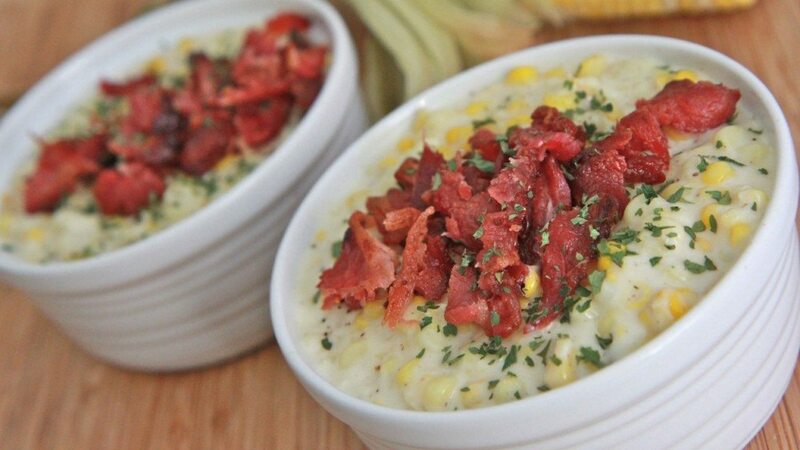 I forget just how comforting and delicious fresh, homemade creamed corn can be. I could seriously eat this stuff as a meal and be perfectly happy. Southern-style creamed corn is sweet, super creamy, fattening, delicious and downright addictive!! Paired that sweet, creaminess with some salty, smokey bacon and baaaaaby YES!! It’s the perfect compliment to a soul food meal of spicy roasted turkey wings, collard greens, candied yams and cornbread. That’s what my grandmother always served with it. 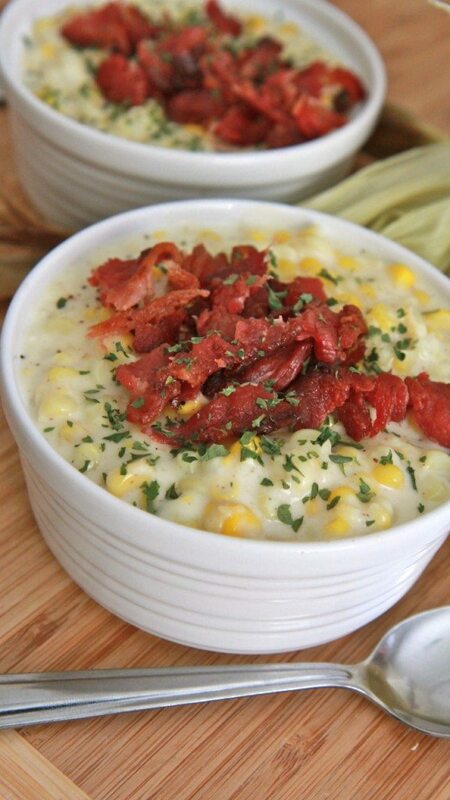 If this is your first time having homemade fresh creamed corn let me introduce you to this delicious side dish! You want to start with fresh corn and either grill or roast the corn in the oven. These two methods creates the most amazingly delicious corn and really brings out the natural sweetness of the corn. If you can’t find fresh corn, then go with the frozen corn as a last resort. Now let me tell ya, I’ve had southern creamed corn prepared with all kinda stuff like cream cheese, half n half, almond milk, etc. My favorite way is to simply use some good ol heavy cream and regular milk. It makes for the creamiest, richest southern creamed corn I’ve ever had! I love it and hopefully you will too. 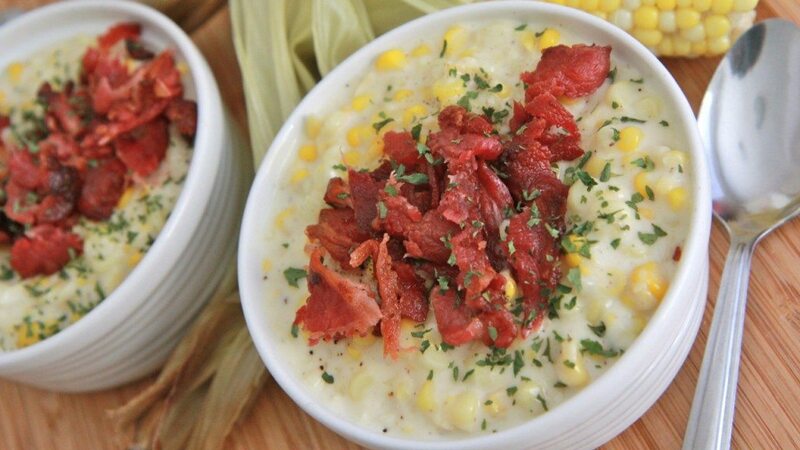 Some southern creamed corn recipes choose to thicken the corn with only pureed corn and that works just fine too if you prefer it that way, but be sure not to puree too much of the corn, we don’t want baby food! 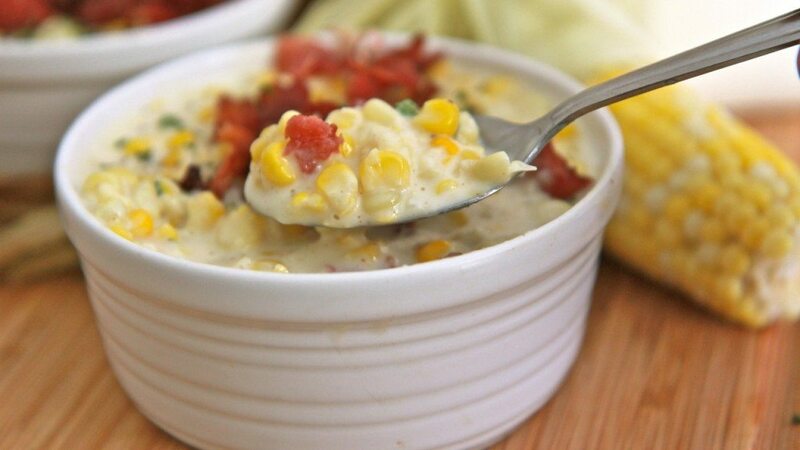 Watch me make this Southern Cream Corn from start to finish! Let roasted corn cool off. Cut kernels from cob into a large bowl. Add in heavy cream, milk and sugar. Set aside. Fry bacon in a deep skillet, leaving 1 tablespoon of oil in the skillet. Chop bacon into pieces and set aside. Add flour to hot oil and stir until flour is golden and cooked. Simmer until thick and creamy, about 30 minutes. This recipe was so delicious. I fixed it fof m u adopted parents and they loved it. For dessert i made thd 7UP pound cake. Usinb heavy whipping cream takes it to another ldvel. Very moist cake. Just delicious. Gawd! Why have I never made this before? Corn season just about here in NC—-will be on my to make list asap. Thank you Monique! my daughter get’s recipes from your web all the time. I am thinking of giving her the cook books for christmas. are they on sale? I made this along with some chicken tonight for dinner. This corn is so good! My family and I enjoyed it so much. Will definently make again, thanks! How long before you have the cookbooks back up on the website? I’m interested in ordering all of them! !